The Environmental Protection Agency (EPA) has given a subsidiary of Conneticut-based Castleton Commodities International the green light for the construction of new petroleum process facilities near Corpus Christi, TX. The EPA issued the final greenhouse gas and prevention of significant deterioration construction permit to the subsidiary, CCI Corpus Christi, LLC, on Sept. 15th. The company plans to build two fractionation units, capable of producing a combined 100,000 b/d and a bulk petroleum terminal. The terminal will include storage tanks and barge loading operations that can handle 500,000 barrels a day of crude condensate for export. Castleton hopes to get some skin in the condensate export game, according to the EPA, but will need additional approval from the federal government. So far, only two companies, Pioneer Natural Resources Co. and Enterprise Product Partners LP, have been authorized to export minimally processed condensate from the Eagle Ford Shale. More than half of all production from play is condensate, which is an ultralight crude oil. In addition to exporting product, Castleton also plans to use the crude condensate to produce diesel, jet fuel, naphtha, and other petroleum products. The project is expected to cost the company $500-million. Buckeye Partners, L.P. announced this week it will acquire an 80% interest in Trafigura AG's South Texas Eagle Ford midstream assets for $860-million. The deal creates a new joint venture, whereby Trafigura will retain a 20% interest in its assets and jointly own the new company, Buckeye Texas Partners, that will own and operate the assets divested by Trafigura. 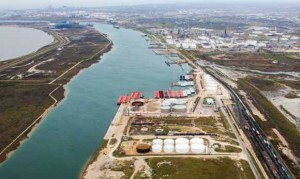 In the deal, Buckeye gains a deep-water, high volume marine terminal located on the Corpus Christi Ship Channel, a condensate splitter and LPG storage complex in Corpus Christi, and three crude oil and condensate gathering facilities in the Eagle Ford shale. All of the assets are supported by 7- to 10-year minimum volume throughput, storage and tolling agreements with Trafigura. Buckeye Texas Partners will invest appoximately $240-million - $270-million on improvements to the system, increasing its liquid petroleum products storage capacity to 5.6-million barrels. A 50,000 barrel per day condensate splitter is currently under construction and is anticipated to be completed by mid-2015. Victoria Express Pipeline LLC (VEX), a subsidiary of Devon Energy, is constructing a 56.4 mile long pipeline from the Blackhawk central delivery point in DeWitt County, Texas to the inlet of Devon Gas Services's terminal at the Port of Victoria. The 12-inch pipeline is expected to come online July 1, 2014, with an ultimate capacity of 100,000 b/d. In late 2013, Devon Energy agreed to pay GeoSouthern $6-billion for 82,000 net acres in the Eagle Ford Shale play. In the first quarter of 2014, the company said its net daily production in the Eagle Ford was 64,000 boe/d. In the second quarter, the company anticipates it will average between 65,000 and 70,000 boe/d, with more than 100,000 boe/d by next year. Eagle Ford producers need to continuously think about how they will get their production to the refining market as activity in the play continues to grow. Wood Mackenzie recently released information stating production from the Eagle Ford Shale will reach 2-million b/d by 2020. VEX is currently conducting a binding open season to attract companies for long term commitments in exchange for access to priority capacity. The open season will end on June 19, 2014. VEX is also constructing an additional receipt point eight miles north of Victoria in Victoria County, Texas. The company may add an additional destination point at Point Comfort in Calhoun County, Texas.